Jerry was well known in Napa, Ca. where he ran his business, Collins Street Rods and Motorcycles for many years. 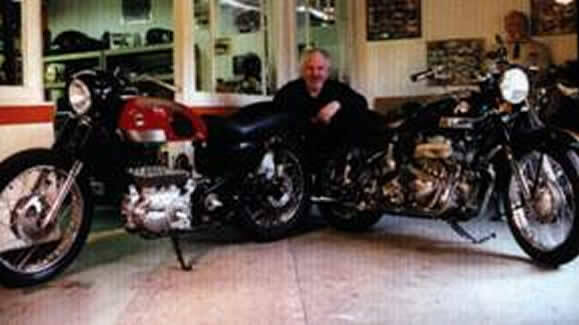 He eventually moved the shop to Eugene Oregon, where he served the hotrodders and motorcyclists of Oregon and Southern Washington until his passing last Friday. He died quietly, without suffering. After leaving the Air Force, he moved to Napa, California, where he opened his shop. He built a number of Street Rods there, including one that took 3rd place at the Oakland Roadster Show, and many choppers, one of which also won its class at the Oakland Roadster Show. Jerry was well known among the outlaw motorcyclists of Northern California, having associated with the Nomads, and was a prospective member of the Valejo chapter of the H.A. He decided not to join, as he was just starting his business, and wouldn't have been able to afford to offer the discount required of all members who owned M/C businesses. After moving to Eugene, he joined the Oregon Vintage Motorcyclists, where he acquired a reputation as a master restorer, and was particularly well respected as an Ariel expert. Although 90% of his business was related to vintage motorcycle restoration, or routine maintenance of Harley Davidson’s, he also built a couple of street rods, and was in the process of building another Ford roadster when he took sick.